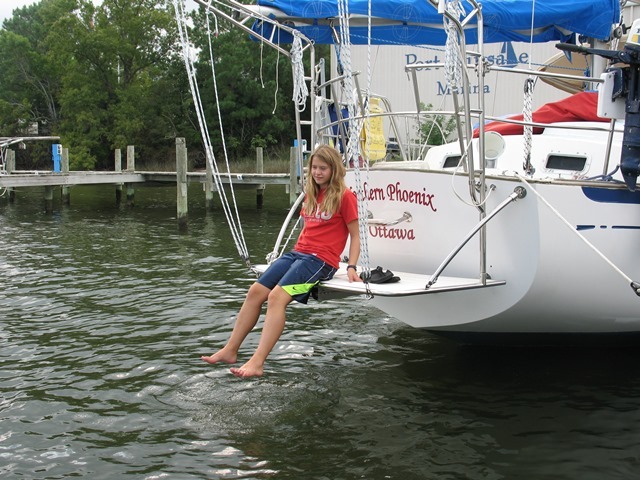 It is located at Bert Jabin Yacht Yard in Annapolis. Our trip is finished, you can see our adventure at www.northernphoenix.ca. Full picture of the boat. Inside and out Click here to go to a Google Docs Folder. All Whitby 42's are great boats. And they all have the basic greats, if you are here, you already know what those are. But this Whitby has been COMPLETELY upgraded. This site gives a history of that. There are some things that are special to this Whitby that make it a ONE OF A KIND. Has been replaced. The old one was removed and two were installed. 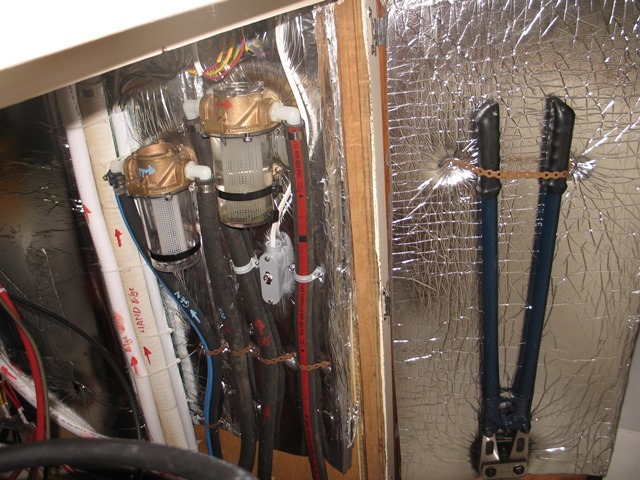 A space was left between for the bilge pump. See blog to see all the work that was done. 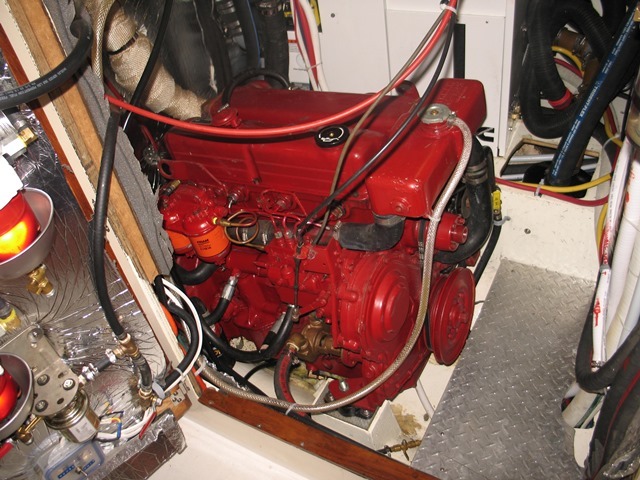 Don't pay full price for a Whitby that has not had the center fuel tank fixed. It is a KNOWN problem. It was expandafoamed in with the hope it would never get wet. They do, and rot out. Not ours! This was all done when the engine was out. Onan 5 kw Generator. NEW with three more years of warranty. Incredibly quite. We watch movies with it on. One button push to start at the Nav. station. Cleanest Engine room you will find. Kept all extras OUT. New fuel filters and water intake filters. All easy maintenance. Custom teak shelving above fridge and freezer for plates. 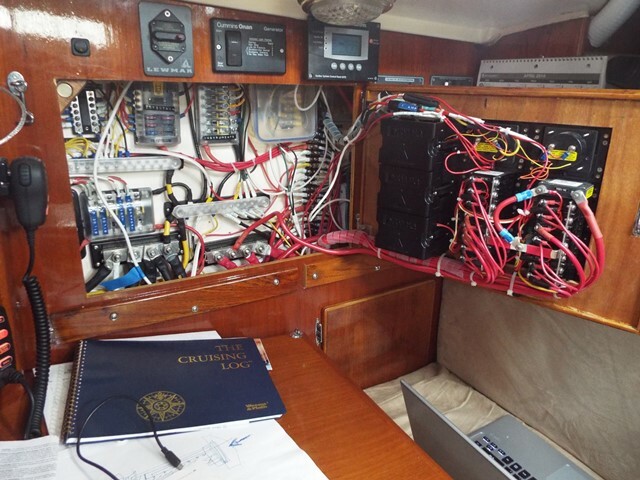 EVERY wire on the boat is new. All marine grade tinned wire. EVERY electrical piece is new. Blue seas circuit board and fuses. Xantrex Freedom True Sine 2000w inverter charger. Cockpit controls for all outside lights. Bow Roller New 2013. Fantastic for anchoring. Made for the Rocna. Stern rail is extra long, additional 8 feet per side. Mast deck bars. FANTASTIC when it is rough. Loved them. Complete Plumbing upgrade. Great control of water tanks. ALL Standing Rigging Replaced in 2013. That is a lot of money and time. All the wood was redone and varnished, 3 coats minimum. New cushion covers inside, new cushions for the cockpit. ALL LED lights inside and outside. You will feel like you are in a modern sailboat. All the pictures come with the boat. All the manuals, all the paper work. on computer files. OK, here are all the little details, still a work in progress. EVERY SINGLE HOSE, (exhaust to fuel to water are NEW), every single WIRE is new. Fuel Tanks: (200 Gallons) TOOK OUT CENTER TANK!!! And replaced with 2 tanks and bilge pump between. This long range center cockpit passage-maker features a very livable interior with two private cabins, two heads and a large salon and galley area. 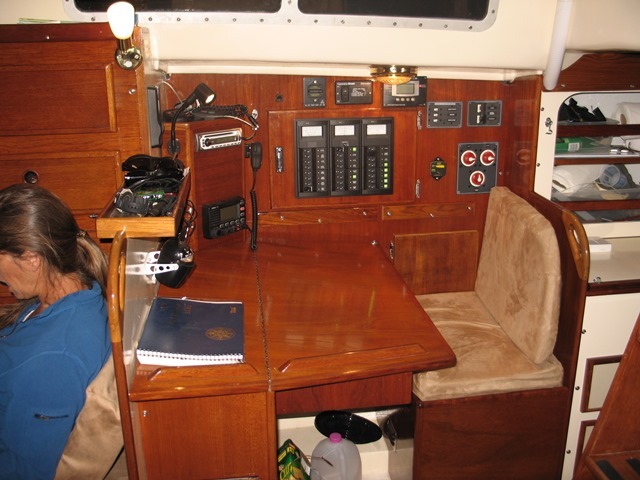 The engine room is spacious so working on equipment there is comfortable. The Forward Cabin features a long and wide vee berth with an insert that can be stowed over the bunk on the overhead. Ahead of the berth is access to the chain locker which has a divider to keep two anchor rodes separated. 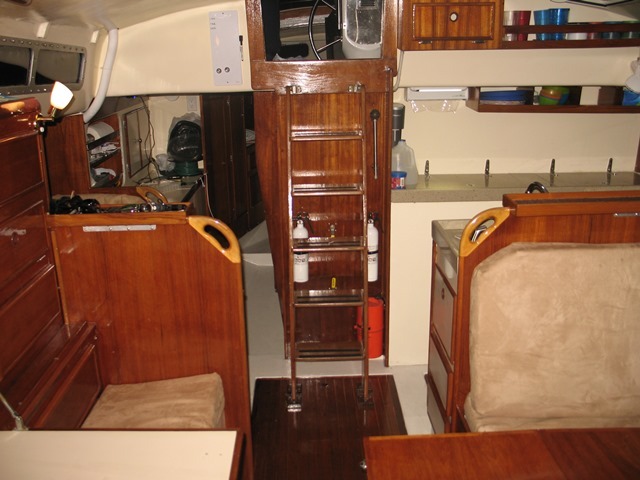 The varnished teak finish was completely redone in 2013. and in great shape and there are teak hull strips on the sides. 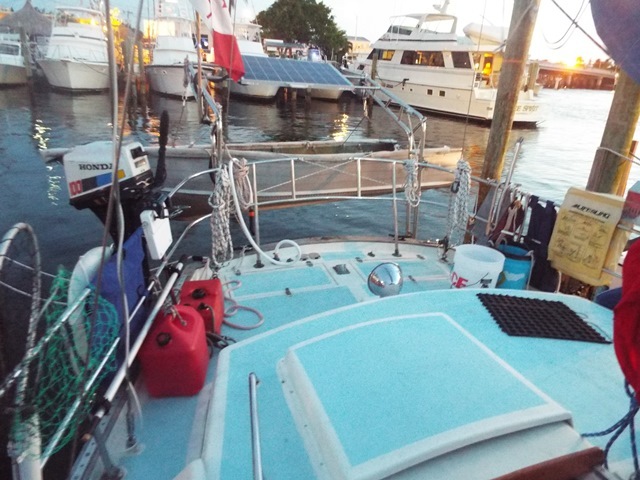 A large deck hatch opens over the berth and there is a folding stair on the bulkhead to assist exiting from this hatch. There is also an opening portlight. Drawers, a large hanging locker and six air craft lockers provide ample storage. There is direct access to the Forward Head from this vee berth area. There is a second access door from the salon. The head is finished in laminate so is easy to clean. There is a vanity sink, in brushed stainless, mirror, Jabasco manual marine toilet, teak shower grate, shower, an opening portlight and a solar powered cowl vent for added ventilation. The Main Salon is large and features two bench seats to strb with storage underneath. To port is an L-shaped settee that pulls out to convert to a berth. There is a two-leave table that folds up out of the way onto the forward bulkhead or down to sit up to six for dinner. Behind the table is a book shelf with 4 shelves. The mast is stepped on the keel but is hidden in in a cushioned fabric cover that matches the seats. 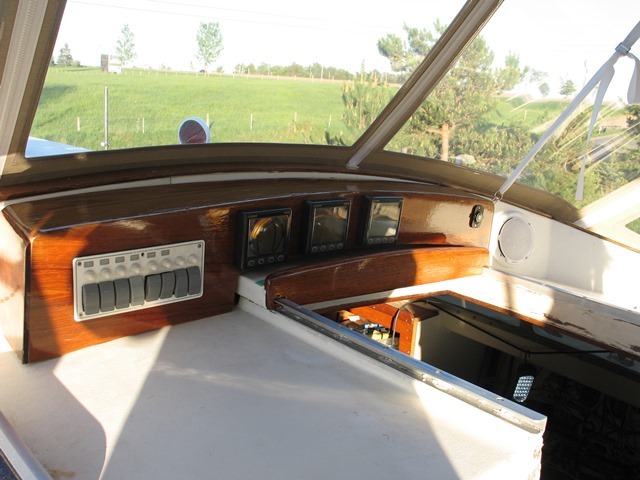 There are four opening ports and four fixed windows and an opening overhead deck hatch with all contribute to making this cabin light and airy and inviting. 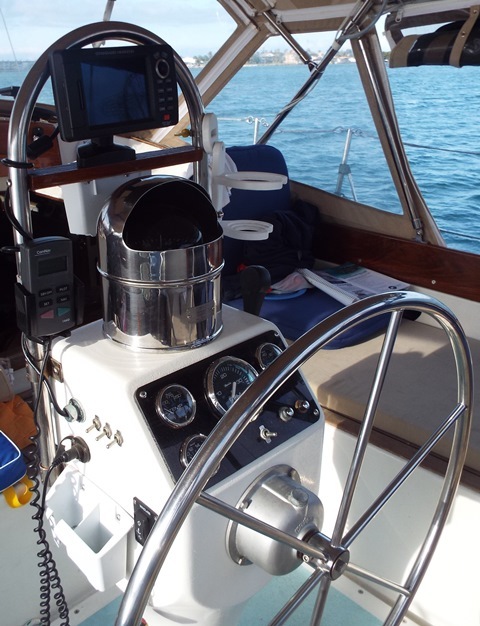 Aft to stbd is a forward facing Navigation Station with seat with storage under. The large surface nav. table is a great place to lay out charts. A waste basket is built-in to the cabinet under the chart table. All electrical runs to the nav. station and can be controlled from the seat, both 12 volt and 110 AC. 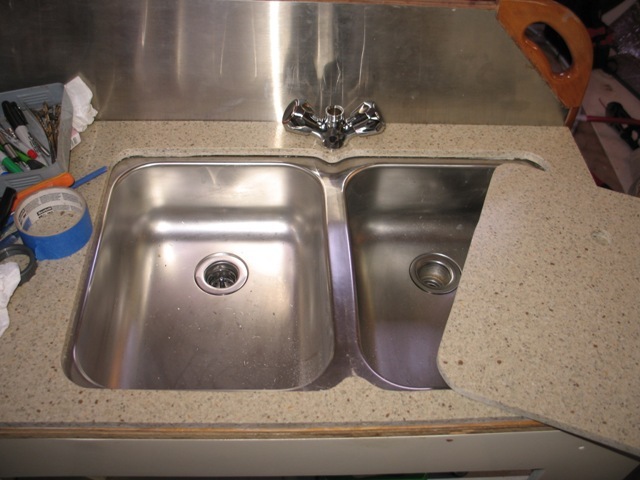 The Galley is a U-shape custom corian counter with a double basin brushed stainless steel sink on centerline . There is a large dry storage locker in the counter and other lockers for food and pots and pans. Five drawers and 3 bins add to the storage of this space. 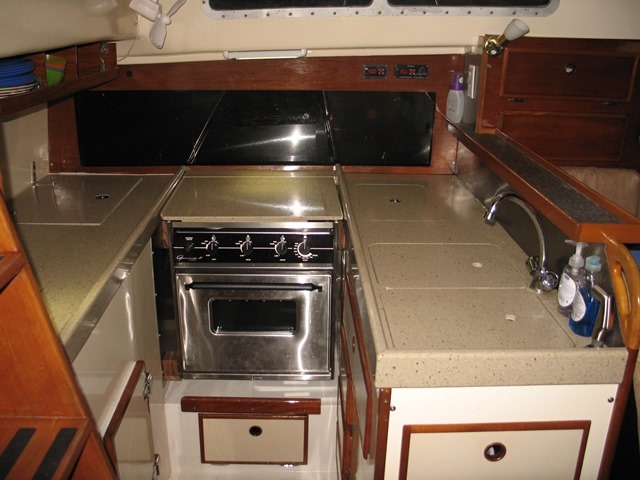 A three burner Gourmet II by princess stainless steel propane stove with oven and broiler was installed in 2013. The ice box and fridge had insulation added and upgraded in 2013. They extends the length of the aft counter and has two top access doors and a single front access door. 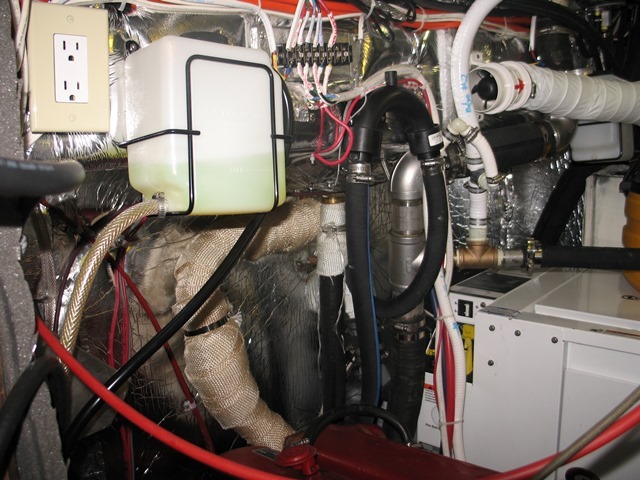 This is cooled by Frigoboat keel cooled system installed in 2013. A teak shelf system above the counter is perfect for plates and other quick need items. In the corridor to the aft compartment is a work bench with lots of storage, including an under the counters in this area. It is chart storage, a feature not found on more modern cruisers. There is a wet locker for hanging foul weather gear and access to the engine room is in this space with two doors. 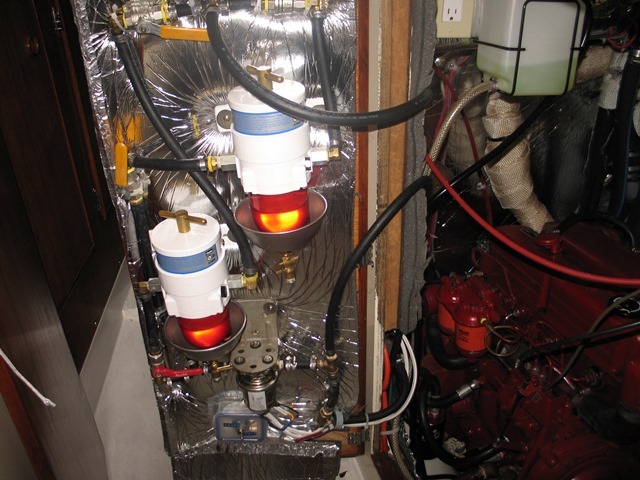 The engine room has been redesigned so that most maintenance can be done from the door. This includes changing the oil, fuel filters, and water intake filters. The Owners Stateroom is aft and this area features a bed that can be set up as two twin beds to port and stbd or as a single large double bed for sleeping athwartshps. There is tremendous storage in two hanging lockers six aircraft lockers, and miscellaneous drawers and bins. 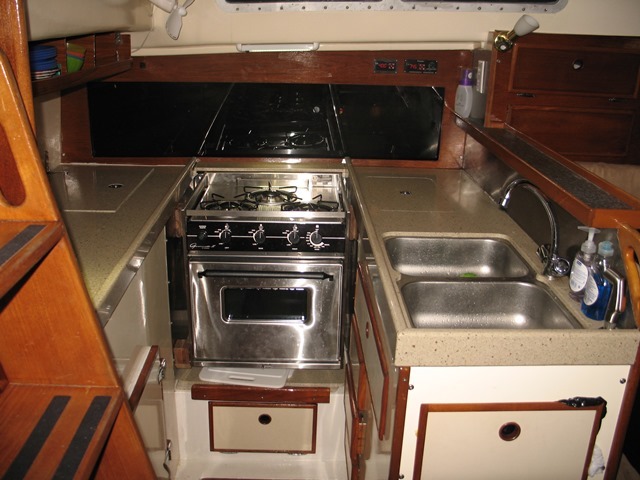 Five opening portlights and a companionway slider and ladder out to the cockpit make this area bright and well ventilated. The en suite Aft Head is in formica laminate and features a Jabasco manual marine toilet, vanity sink, shower, and shower grate. There is an opening portlight and solar powered vent here. Generator 5 kw. Onan. 3 more years of warranty. New 2013. Ford Lehman diesel - 80 hp COMPLETE REBUILD 2013 All upgrades as per American Diesel. Electrical: NEW 2013. Completely rebuilt. EVERY wire, EVERY Connection, EVERY electronic. Batteries NOT in engine Room. All internal LED lights and NAV lights. Plumbing: New 2013 Every hose of every kind is new. EVERY PIPE and HOSE is NEW 2013. Completely rebuilt entire plumbing system. 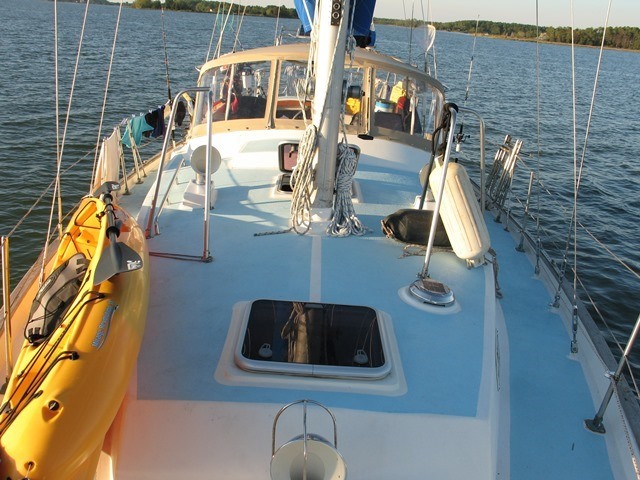 The hull is a traditional full keel design with rudder hung at the end of the keel. The prop is protected in the aperture. 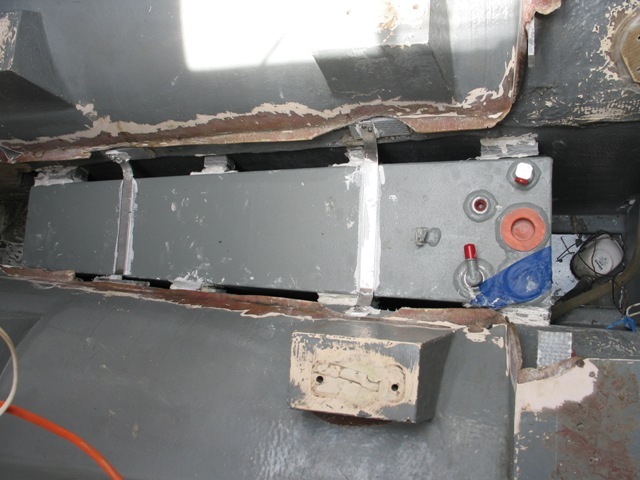 The ballast is encapsulated - no keel bolts. The hull of Tradition is white with a painted blue boot stripe and blue anti-fouling paint. The deck is off white with light blue KIWI Grip paint non skid (Amazing stuff!!!). 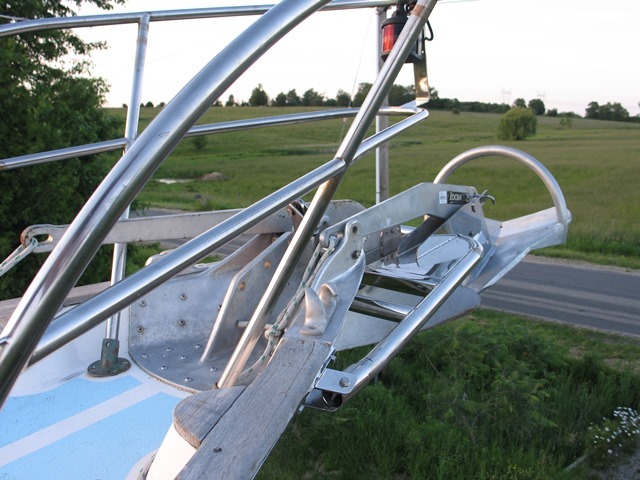 ALL RIGGING REPLACED NEW 2013 Most running Rigging replaces as well. 45# CQR anchor with 30 feet chain and 200 feet rope.